I don’t know about all of you, but I’m tired of hearing about politics. And how bad food is for you these days. And who Amanda Bynes crashed into this week. I decided to take pictures of things that have made me go “huh” lately. Would anyone actually wear this? If a friend of mine wore this, I wouldn’t know whether to laugh or pet it. It’s just not my style. And who would pay over $100 for one?! This man is in love with balloons. He loves rubbing up against them and cried when one popped. No surprisingly, he’s single. How would he even find a woman who could tolerate that? "Hi! I love balloons and they're all over my home. That cool?" Our cat Max loves to have his stomach rubbed. I’ve never seen another cat who liked it. 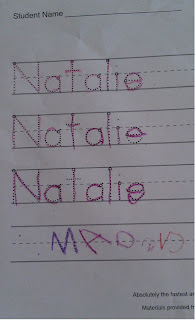 Remember how Natalie used to just write "Na" for her name? Imagine my surprise when I saw this. I was like, "Ahh, she's regressing!" 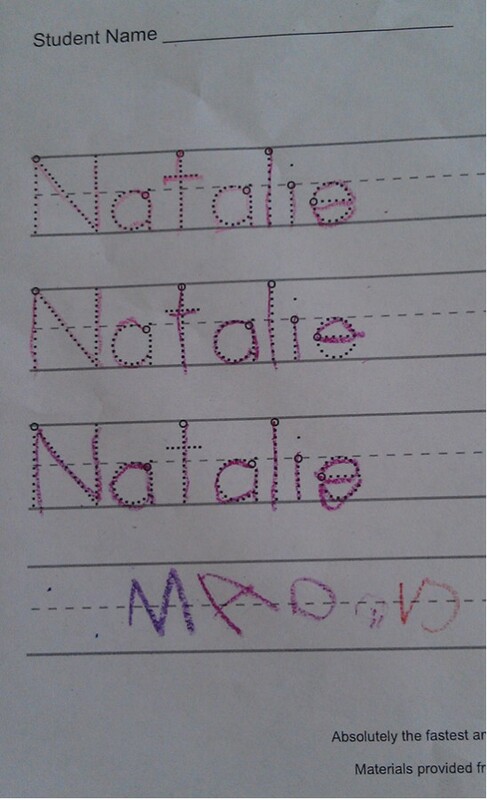 It turns out she was tired of spelling her name and wanted to try and spell out her friend Madelyn's name. Oh. Still. I told her she needed to spell HER name in school. So is there anything that's making you go "huh?" this week? Those vests are a little scary. Balloon guy is wacko! Most of the outfits on Emmy made me go huh? Some of the winners also! My daughter had a hard time with her name also...it's when I wished I named her May or Kay something easy and short! i have one kitty who loves to have her belly rubbed and another kitty who will remove your fingers if you touch any part of her besides her head. i think a kid would like that vest. a kid who likes to wear costumes. or maybe someone who's into being a furry on the weekends but has to wear real clothes mon-fri.
You gave me a good laugh!!! Stopping by from SITS! 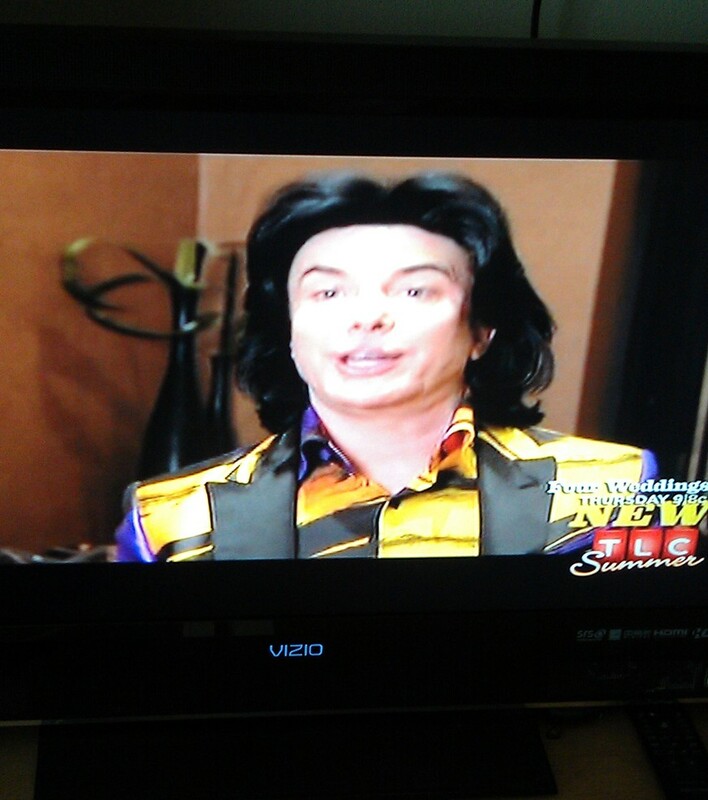 My sister-in-law has one of those vests. It looks just exactly like what you would expect it to. 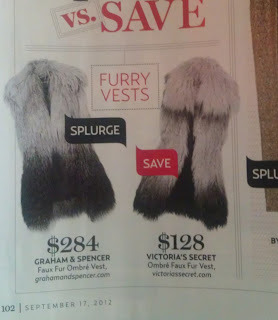 Most of the expensive fashions out there right now seem pretty gross to me - or maybe I'm just getting all fuddy-duddy? Regardless, they all make me have "huh" moments: bubble-bottom-skirts, shirts that blouse out at the waist but gather in at the hip, shoes that look like you hate your feet and need to put them in the toughest foot-cage on the market...Where are the true-waist dresses, I fuss, that go in where we go in, and bell out where it's nobody's business about how chunky we are? the only thing that's made me go "huh?!" is my daughter who wakes up at 6am on the weekends ready to GO, yet sleeps in until well past 730am (if i let her) on the weekday. oh, and then she's a total crabbypants when i have to wake her for school. why can't she wake early on the weekday and sleep in on the weekEND?!? WHY?!?!??!!??!?!?!?!?! Those vests are just odd. I really don't understand fashion these days. 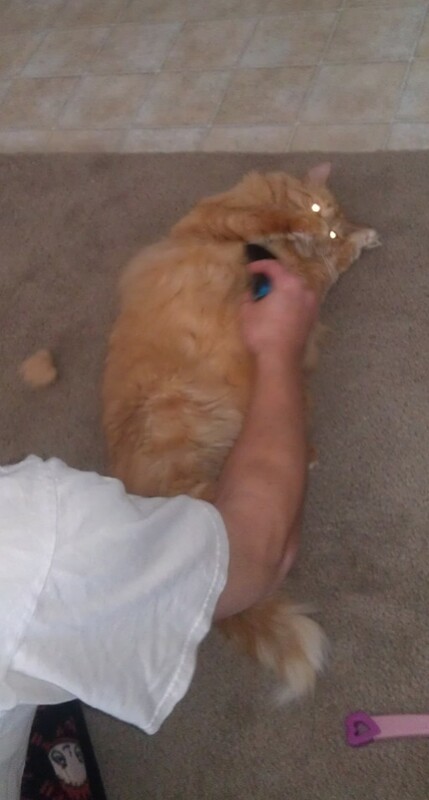 My cat LOVES to have his belly rubbed. He purposely lies on his back in his "cute" pose if I'm not paying enough attention to him. Definitely an unusual thing for a cat, as far as I've been told. I think if you combined rubbing those balloons on you.... with wearing a furry vest like that... you could possibly spark a fire! hehe that lost story is too funny! The man that loves balloons? where did you find him? Love it. They made me laugh. I love the balloon man. Imagine his chat-up lines! Our cat will let us rub his belly, but only to bite our hands easier. Let's see, 5th grade writing homework is making me tear may hair out. That's all I got. Oh geeze those vests are hideous! I would definitely laugh at my friends for along time if they wore one. That balloon obsession is a little odd..
those vests! and who is that guy?? I love this post! I feel the same way about A LOT of things. Although, I usually just post pictures about it on a Wordless Wednesday post. Not always though, but sometimes. So funny! Two of our four cats love to have their bellies rubbed. Our girl, Kisses, flops on her side when my husband or I walk by and gazes up expectantly. Also, surprisingly, all four of our cats like when I kiss their faces... I'm the only one who is "allowed" to kiss their faces. Except for the little one, Tiger... he comes to my husband, son, and me looking for kisses. He'll mush the top of his head against our lips. I would absolutely laugh at anyone (friend or not) that wore a vest like that. Ridonkulous. Those vests are crazy - and no, I definitely wouldn't spend 100 on one! I did splurge and spend $15 on a hat that has two huge red and gold pom poms on it, to wear at a rally for my husband's favorite football team. But $15 is one thing, $100 is quite another. 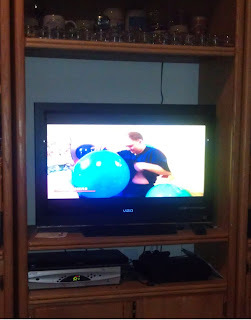 I saw a show once where a guy got sexual gratification from balloons. I never understood that.